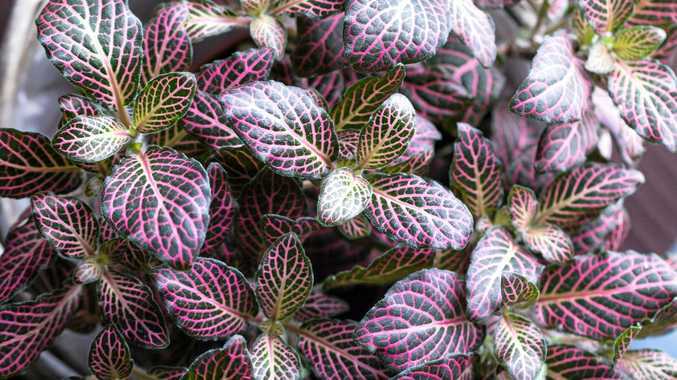 Nerve plants (Fittonia sp) are popular indoor plants with vividly colourful foliage. There is a wide variety of nerve plants available, some having green leaves with cream or white veins, others with deep pink markings and some with stunning predominantly white foliage. They are perfect plants for small spaces, only reaching about 15cm tall. They are native to humid to tropical forests in South America, so are well suited to growing in a terrarium, where their vibrant foliage looks fantastic when grown with green leafy plants such as ferns. Nerve plants will do best when grown in a warm, well-lit spot that is protected from direct sunlight and draughts. Keep the potting mix consistently slightly moist. Regularly check the moisture levels in the potting mix by inserting your finger into the top few centimetres. If it feels dry and dusty, water the plant. If it's still moist, leave watering for a few days. Nerve plants like to be kept moist but not waterlogged. During hot or dry weather, nerve plants will appreciate their foliage being misted with water.